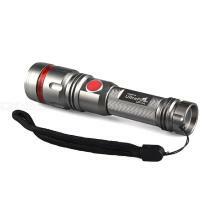 UF-1A LED 250 lumens 3-mode Zoomable waterproof flashlight with high-quality CREE LED, output ultra-bright white light, up to 250 lumens, with an LED lamp bead, UF-1A\\\\’s beam range can cover up to 100 meters. The UF-1A has an IPX4 waterproof rating that works well in heavy rain. Three different modes make the versatility suitable for a wide range of environments.